On a cloudy February 12th we visited Tāne Mahuta, about which Wikipedia says: “Tāne Mahuta is a giant kauri tree (Agathis australis) in the Waipoua Forest of Northland Region, New Zealand. Its age is unknown but is estimated to be between 1,250 and 2,500 years. 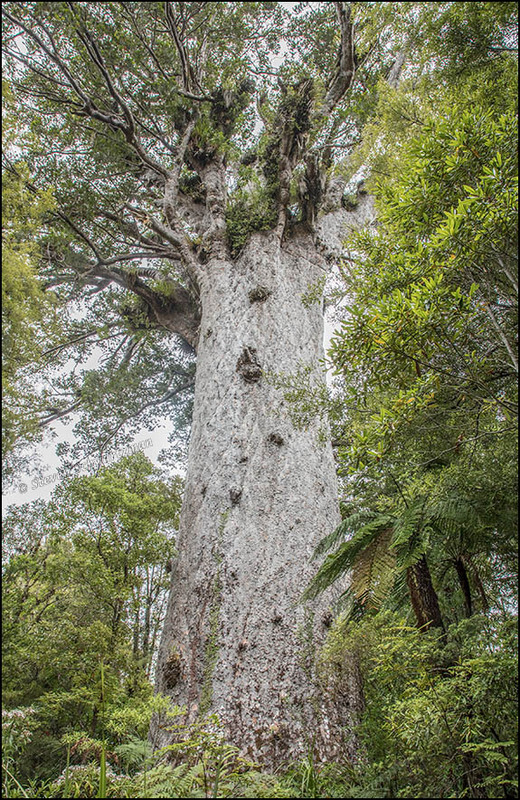 It is the largest kauri known to stand today. Its Māori name means ‘Lord of the Forest’ (see Tāne), from the name of a god in the Māori pantheon.” If you’d like, you can read the rest of the article, which includes measurements. The kauri trees in New Zealand suffered a fate similar to that of the sequoias and giant redwoods in California: in the 1800s and 1900s most got cut down for their wood. I love that the birds and trees of the forest are considered Tāne Mahuta’s children, but I was even more touched by the diversion of water to the tree during the drought. It reminds me of a baobab: impassive, but approachable. I can see the resemblance to a baobab. Tāne Mahuta is no longer approachable (as I’ll explain in a follow-up post), but it is impassive. You and Steve Gingold have an Ent-erprise going. I’d never heard of an ent until he mentioned it in a comment last year or the year before. In any case, the kauri is a big tree, that’s for sure. At first I thought LOTR was on the order of LOL. LOTR goes well with LOTF (Lord of the Forest), which is what made you think of it. And now the threat is dieback. http://www.forestandbird.org.nz/saving-our-environment/threats-and-impacts-/kauri-dieback-disease-help-protect-the-kings-our-forest A magnificent photo of a magnificent tree. I don’t remember hearing about that on our first visit, but this time we saw several signs warning about the disease. As for the photograph, I’d much rather have had a blue sky (I don’t like aiming into grey-white skies), but on a trip I usually don’t have time to return to a place and have to settle for the weather I get. Not sure what it is like up North but we have gorgeous clear blue sky today. The quandary of the nature photographer: not being able to be everywhere at once. Even in my local area I can’t visit all the sites I’d like to on one or even several days. Inevitably I must have missed some great things. By the way, those clear blue skies visited Austin yesterday and again today, so I went out photographing on both days—especially as the forecast calls for overcast skies for days to come. what a magnificent tree! wow; i think i might have stood there for an entire day,just gazing up and pondering its place in our world… it is, for sure, one of our elders! The kauris are an equivalent down there of our redwoods and sequoias, with people treasuting the large remaining ones. Tāne Mahuta has become a tourist attraction, to the point that I didn’t initially find a parking space along the road and had to double back. Is there some species of huge tree that plays that role in Ecuador? i smile.. oh yes… will be back soon with the answer! It thrives on the Pacific coast where there are more months of drought than of rain. Presently they’re attired in thick abundance of leaves…. I’m familiar with the giant ceiba trees from Honduras, but the ceibo is new to me. So’s the saman. Thanks for the intro. Have you been to see it?